Is Your Dog Limping? In Pain? Slowing Down? The Joint Support Kit can help. Backed by Research. Recommended By Veterinarians. Give your pets fast PAIN RELIEF directly in their food bowl! The Joint Support Kit includes three scientifically natural remedies proven to help reduce inflammation and improve mobility. Amazing Omegas, Curcumin For Pets and Arthrosoothe For Pets include research-backed, veterinary approved ingredients such as omega 3 fish oil, curcumin, glucosamine, boswellia, green lipped mussel and more. 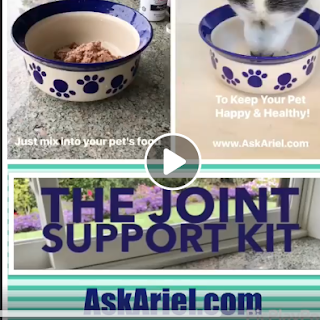 The Kit gives your pet a variety of nutrients offering the best chance of your pet feeling better versus just relying on home remedy by itself. If your dog has difficulty getting up or down, has arthritis or just slowing down due to old age, providing natural remedies can help them get moving again. Some pets may not want to go on walks any longer because they are in so much pain. These vitamins can be used along with medications and often reduce or eliminate the need for pain medications. $20 Savings when you purchase the kit vs buying the products separately. Please click here to learn more.